There are two approaches to negotiation training currently offered by consulting and training companies. The first approach is to train people on a laundry list of negotiation tips and tactics. You can usually identify this approach from their website or airline magazine advertisements which give a large running list of tips like dealing with good/guy bad guy, handling last minute “nibbles” from buyers, etc. While these tips are useful, this approach does not offer an organized methodology for planning and implementing a sales specific negotiation strategy. And they certainly DO NOT connect corporate margin and profit strategies to in-field pricing and contract decisions. The second approach to negotiation training is usually offered by universities or negotiation experts associated with academic institutions. This approach is based on negotiation theory and methodology usually developed from labor disputes; arms control talks or other non-sales negotiation situations. If you play win-win with a hard ball negotiator, you will lose. Being fluent in win-win negotiation techniques alone, does not make you the best negotiator. The best negotiators are fluent in both win-win AND hardball approaches. The Negotiating with Tough Customers Workshop is specifically designed to help your salespeople improve the outcomes of their negotiations when up against the toughest customers. 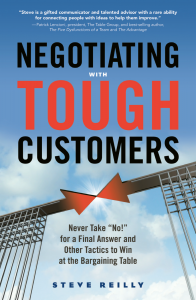 The Negotiating with Tough Customers Workshop is based on the book by the same name authored by Steve Reilly. Steve has spent the last twenty years working with Fortune 100 companies is some of the toughest negotiation situations. The Negotiating With Tough Customers Workshop is a two-day, fast-paced, customized seminar that incorporates Industry-Market-Company (I-M-C) * negotiation scenarios into the workshop content. Our customization process is straightforward and simple. Using designated Subject Matter Experts (SMEs) that you identify, we create three scenarios incorporating your I-M-C details into the program. *I-M-C Stands for Industry-Market-Company specific negotiation. Each of the SPJ Consulting Negotiating With Tough Customers Workshops integrate your Industry specifics, Market specifics and Company specifics into the workshop. Our proprietary I-M-C design makes us the only negotiation skills consulting firm with the ability to connect your corporate strategic profitability objectives into in-field pricing decisions.